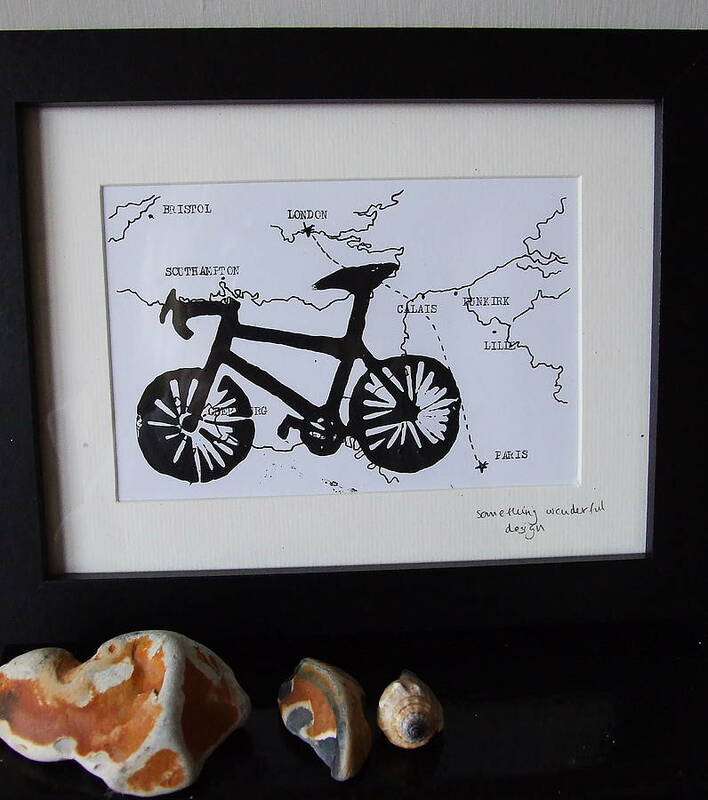 Celebrate the bike lover in your life's passion! 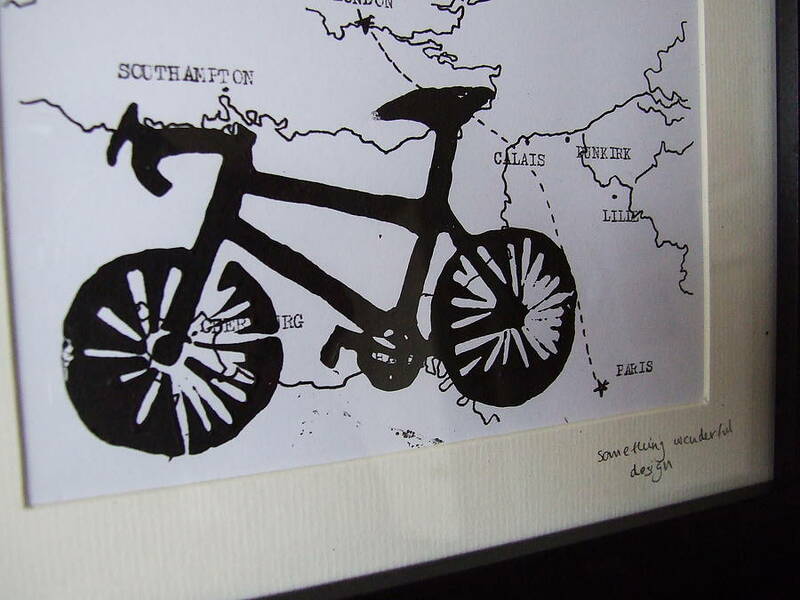 Personalised bike print on a hand drawn map of any location, available framed or framed and mounted. An ideal gift for the cycle enthusiast and number one Father's Day gift, this beautiful linoprint of a bicycle on a hand drawn map of any location is certain to be a winning piece. 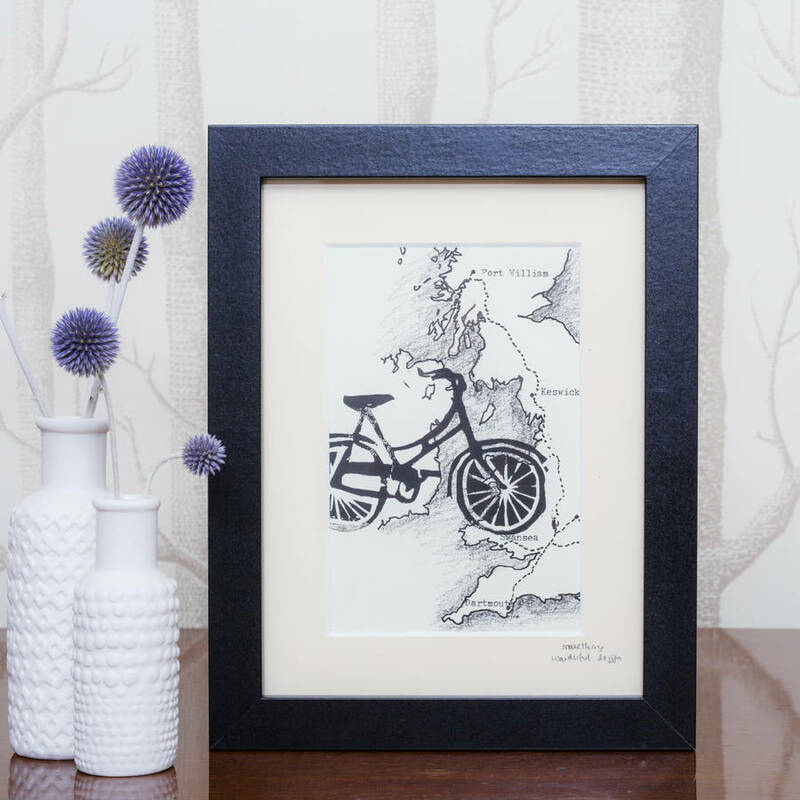 Whether you choose your local area or a ride further afield, order a print for that really unique present. 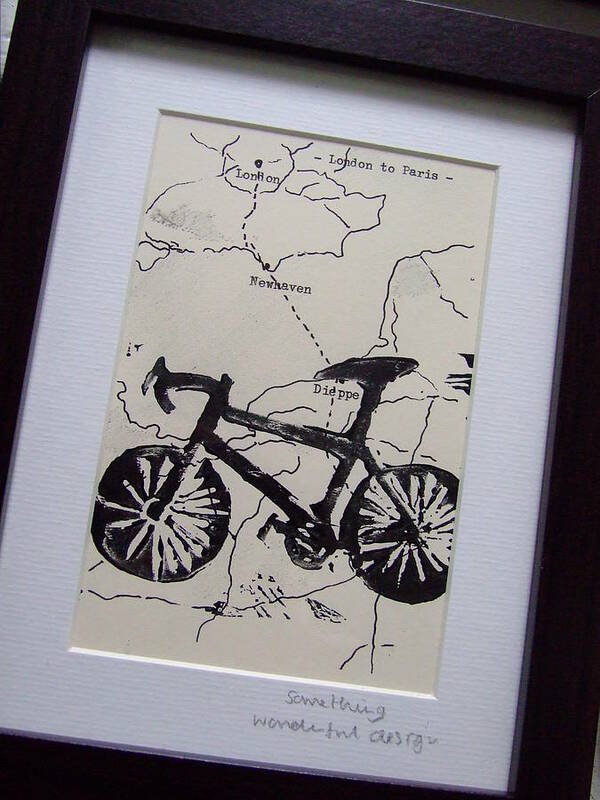 The ideal gift for someone who has completed a cycle race, each print will be absolutely unique. 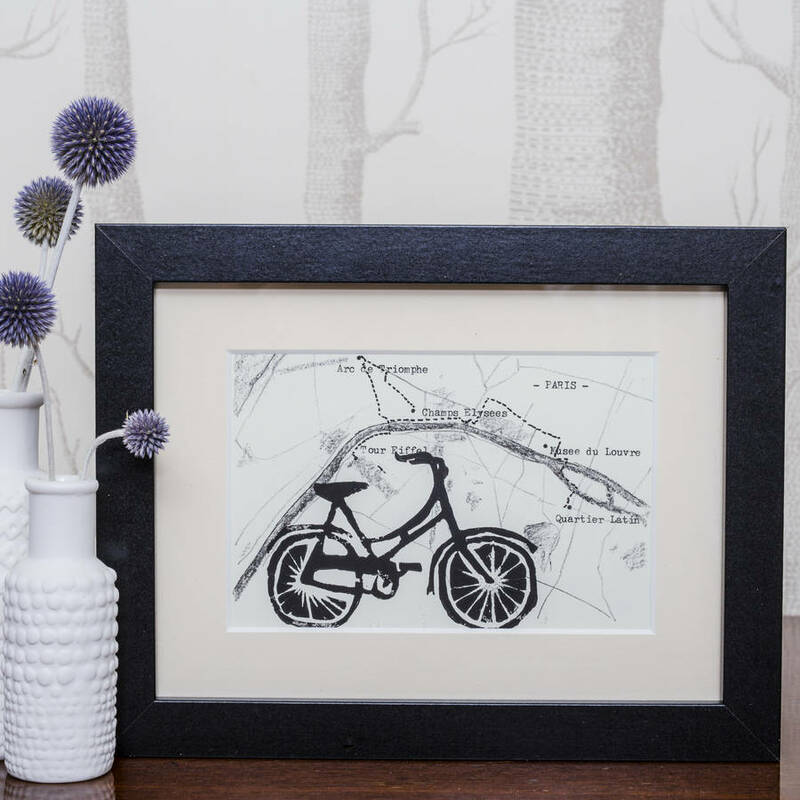 Be it London to Paris or the fields behind your house, a map of your chosen area will be plotted and drawn by hand and your choice of bicycle handprinted on top in black, with the whole piece beautifully framed and ready to give or keep. 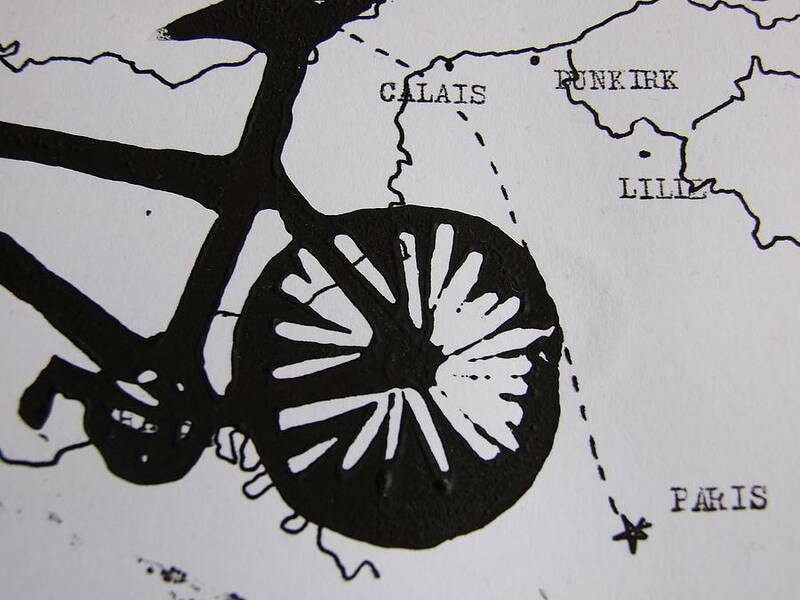 The map is drawn by hand in black ink, with up to five key place names added by typewriter. 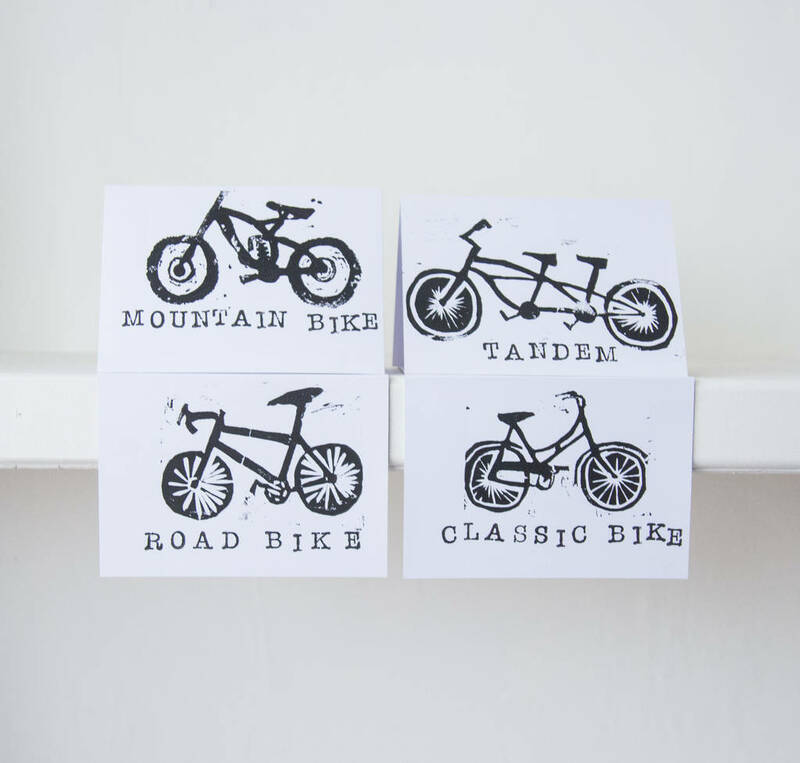 You can select from a white or cream card background, and choose between a classic bike, road bike or tandem. 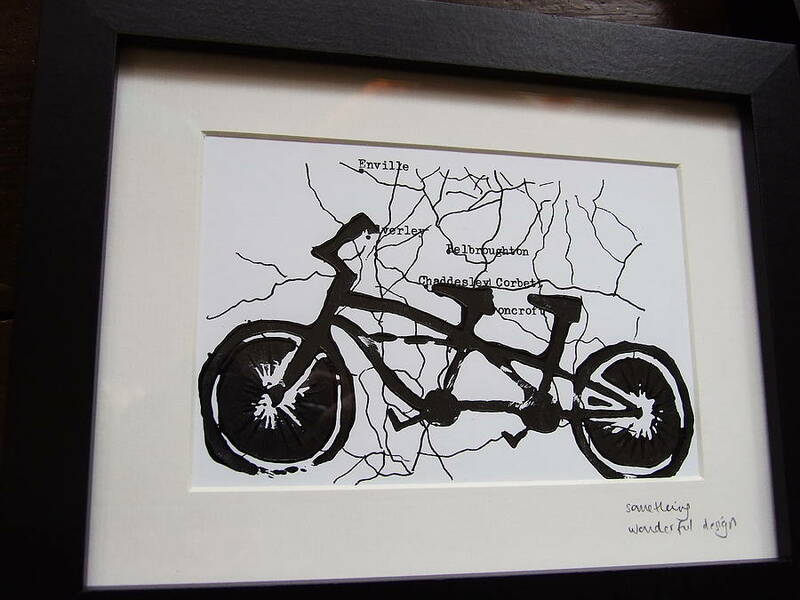 The print is in black ink, and each print is signed and framed in a black frame. Gift wrapping is free of charge and comes with a hand printed tag- just select it at the checkout if you'd like to have this. 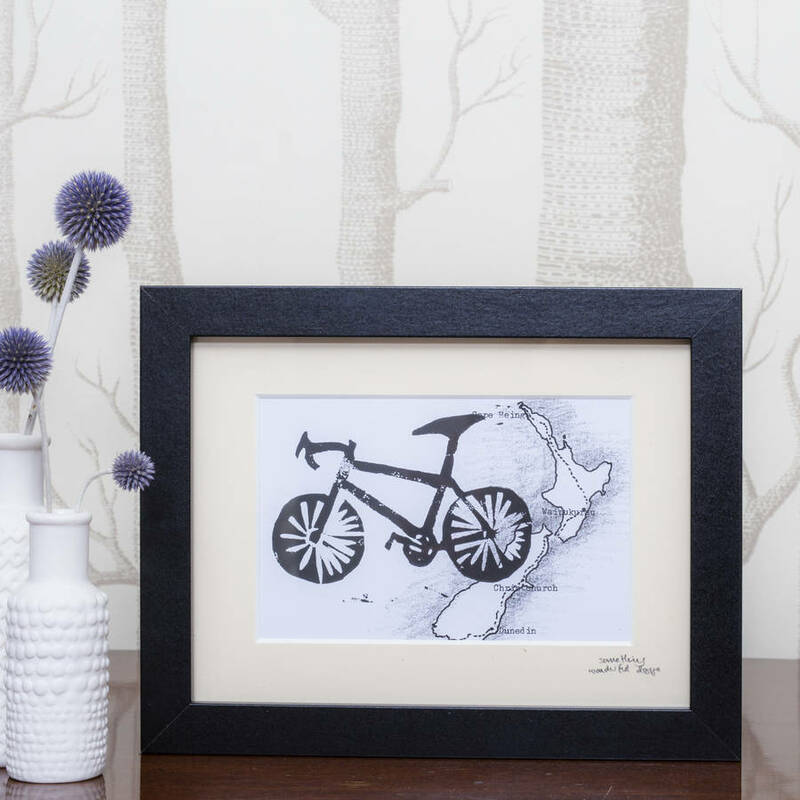 The prints are finished in a cream mount with card backing; you can also have the print framed (with mount). If ordering the mounted only version it will be presented in a cellophane sleeve. All options are stickered and tissue wrapped as standard, making them perfect ready made personalised gifts. 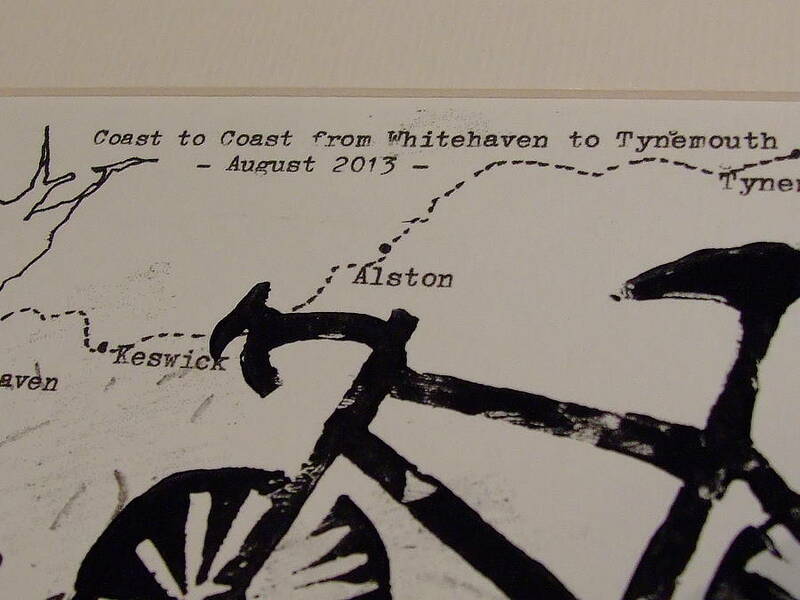 You can even have a dedication handwritten in pencil on the card mount to personalise it even further, e.g. "Well done Dave, March 2018". Just let me know what your message is in the relevant box after selecting the 'Optional Dedication on Mount' choice at checkout. 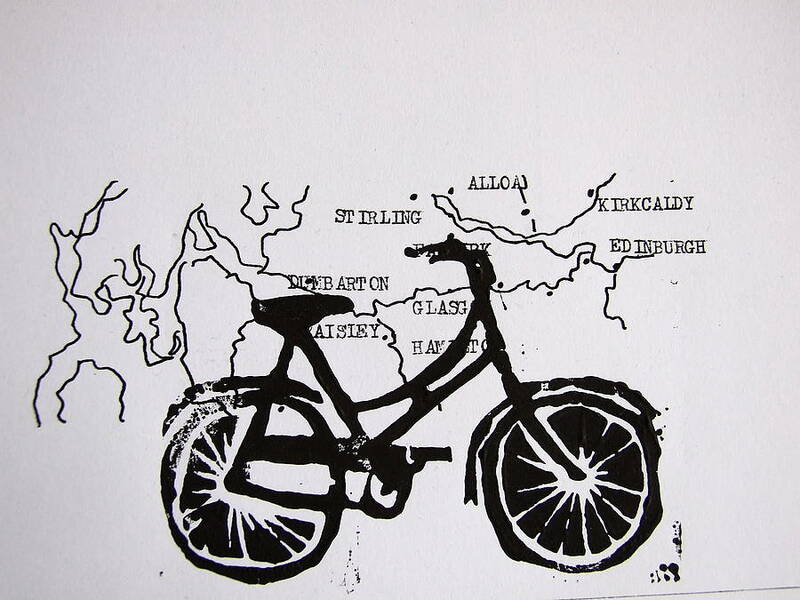 Linoprint on artists 160gsm card, printed in waterbased printers ink, framed in a wooden frame with glass. The frame measures 8 x 6", and may be wall hung or placed on a shelf.